So there you are, a wide-eyed silent film newbie, getting ready to pop in a pre-1927 film for the very first time. With your popcorn and beverage at the ready, you settle into the couch and the film begins. There’s the black and white footage (or maybe it’s tinted sepia), running slightly faster than life, and you see women in dresses and men in straw hats, and maybe you catch a few Model Ts going by. But are title cards really that unwieldy? Certainly they can distract you from the film at first, being as old-timey as organ grinders’ monkeys and all. But I can promise you that you will get used to them. And not only will you get used to them, but they will add a level of participation to your silent film viewings that you may not have experienced before. Also, your life will be enriched by title cards like this. 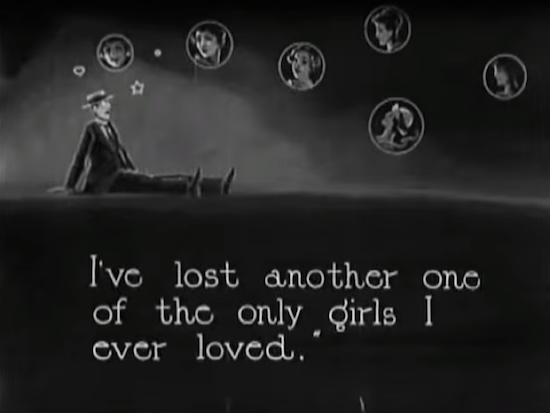 From A Flirt’s Mistake (1914). At first, filmmakers used title cards very sparingly and only imparted the exact amount of information audiences needed to know. Some studios used them to “announce” each shot and describe what would take place, rather like those long chapter titles for serialized Victorian novels (at that time title cards were called “leaders”). As films rapidly grew more sophisticated, decorative frames would often surround the words, with studio logos in the corners. Main characters were sometimes introduced with title cards, which would also contain the names of the actors playing them. At times, the actors themselves were announced via title cards, the film cutting to each one smiling and bowing at the camera–an early version of opening credits. By the mid- to late -1910s, titles became more elaborate and were an integral part of the overall movie experience. Ironically, the more cinematic language fell into place the more title cards seemed to be in use — they weren’t just for dialogue. Dramas often used romantic-sounding language and even bits of poetry to help convey the mood of the film. Jokey titles added to the humor of comedies. Artsy films would try out edgy fonts. Some backgrounds might be textured instead of black, while others might have paintings or cartoons. A humorous title card from Harold Lloyd’s Haunted Spooks (1920). Not only did all this keep audiences from getting eye fatigue from the frequent switches to black title cards (a possible reason why filmmakers started tinkering with painterly backgrounds) but they added to films’ artistry, too. Why, you might wonder, didn’t studios simply use subtitles right on the images themselves? The technology available to make subtitles did exist (although it was more difficult to do than it is today). The main reason titles stayed in place was to make it easier for theaters in other countries. Simply change the language in the title cards, and presto! The foreign language version was ready to go. Today, flowery language and textured backgrounds tend to be lost on us at first, since it takes some time to get used to the picture being repeatedly interrupted by blocks of words. You might even feel like it’s a chore. However, there’s a definite rhythm to the way silents used title cards. Let yourself get swept away by the story, and in time you’ll start to sense just when one is coming up–and even look forward to the clarification it’ll bring. In fact, I can almost guarantee that at one point there will be a magical “ah-ha!” moment. This is when a character begins to speak and for a second you wish you could hear them, and then you brighten, realizing that a title card must be on the way. And there it is, your savior in a vintage font. That, my friend, is the moment when you’ve gone from being merely a passive observer to a participant in the film itself. Artsy titles absorbing us in the story of The Cabinet of Dr. Caligari (1919). If you think of the way many folks watch movies nowadays — half-listening, with a phone in one hand — silents are a welcome change of pace. They require our rapt attention. Miss even one title card, and the film might no longer make sense. And this is a good thing, for when distractions are put aside you can truly absorb the film in front of you. You can focus on characters and plot points uninterrupted, free for a time from the normal stress of modern life (if I may be so cliched). In a sense, silents can be a tonic. And thus, my friends, I urge you: learn to love those title cards! Far from being just the tools that helped films limp by until the talkie era finally arrived, they were a unique artform in and of themselves. And today, they can help us to more fully experience and more deeply appreciate these wonderful, historic early films. 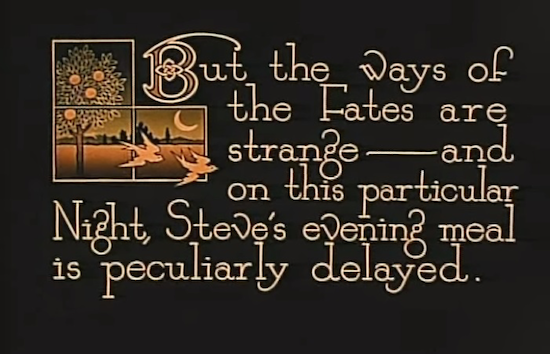 This entry was posted in Posts by Lee Stans, Silents are Golden and tagged silent film title cards. Bookmark the permalink. I kind of have a love-hate relationship with title cards. 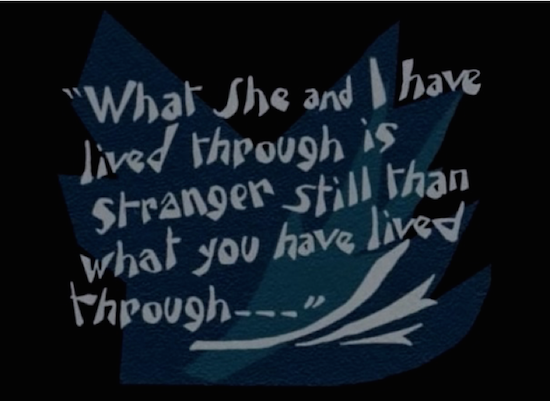 I love them because they help tell the story/premise of a silent film. However, they can be intrusive. This means that they sometimes get in the way of expression without words. Sometimes you don’t need words to create an impact. Sometimes, though, the titles could add to a film’s impact–lines of poetry might add to a dreamy atmosphere, or some well-written prose could boost a film’s artistry. I will say, though, that there are some lesser silents that certainly could’ve used a “less is more” philosophy when it came to their titles! Editing in the silent era was not a job for the impatient–or lazy. That’s for darn sure!